American Diner 5 light ceiling fitting in a satin silver finish. This pendant light is attached to the ceiling by an a satin silver ceiling rose and suspended on a link chain. The chain is approx. 50cms and can be shortened if necessary. 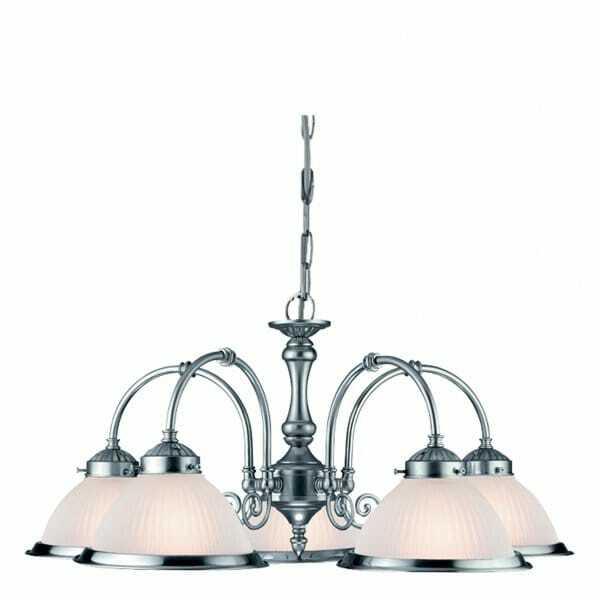 Can also be converted to a flush fitting ceiling light by omitting the chain, making it suitable for slightly lower ceiling heights. The satin silver frame supports the 5 downward facing lights which are carried on tubular arms with scroll detail. The bulbs are contained within the translucent opal white ribbed glass shades. This ceiling light is one of our best selling lights and deservedly so. The American Diner lights are an ideal choice if you wish to continue the same theme within open plan living areas or in adjacent rooms. A well-priced range of lights which offer real value for money.